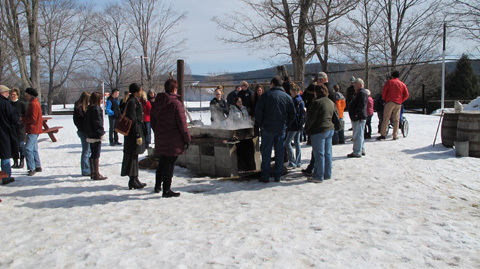 Experience Sugaring Off Sundays at The Farmers’ Museum! The perfect family day-trip this winter! March 3, 10, 17, 24 and 31 - Every Sunday in March! Breakfast: 8:30 a.m. – 1:00 p.m.
Activities: 9:00 a.m. – 2:00 p.m.
Join friends and family on Sundays this March for another season of Sugaring Off Sundays at The Farmers’ Museum. The weekly event begins March 3 and continues each Sunday during the month (March 3, 10, 17, 24 and 31), offering contemporary and historic maple sugaring demonstrations, fun activities for the kids, and much more. A full pancake breakfast including scrambled eggs, sausage, and home fries is served from 8:30 a.m. to 1:00 p.m. with all other activities scheduled 9:00 a.m. to 2:00 p.m. There is “sweet” fun planned for everyone each Sunday. Taste hot maple syrup poured over snow, known as jack wax. Children learn how to tap maple trees. Watch our talented craftspeople at work in the Blacksmith Shop. Stay warm as you ride the Empire State Carousel inside its heated enclosure. Wagon rides around the historic village are offered from 10:30 a.m. - 1:30 p.m. (weather permitting). At the Children’s Barnyard, admire our Heritage breeds of chickens, turkeys, and sheep. The Otsego County Maple Producers will be on hand to talk about maple sugaring and offer local maple products for sale. Delicious local maple syrup is served at the Sugaring Off Sundays pancake breakfast. Admission: $10 (adults 13+); $9 (museum members); $6 (children 7-12); $5 (museum members 7-12); $3 (children 3-6); and free for children 2 and under. Admission includes full breakfast. No reservations are required. Museum shops will be open. Sponsored in part by Bank of Cooperstown, Five Star Subaru, Haggerty Ace Hardware, and The Otsego County Maple Producers. Our heritage breed farm animals would love a visit from you---be sure to visit the farmstead, too!